Just in from SPAIN! This Sorisa Hydraulic Stools are designed for optimal comfort with an adjustable spring-loaded back, and tilting seat. The metal foot ring is an optional add-on. Top Quality and Easy to Use! Sleek and modern design plus spring loaded back make movement easy while working! 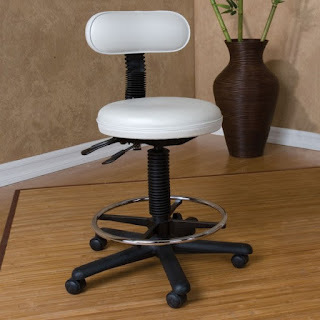 I think this would be an ideal stool for Estheticians, Nail techs, Lash Artists and Spa professionals. 5 easy glide wheels make this an breeze to move between treatment rooms!